IMCORP was again contracted to commission a wind farm collector system using Factory Grade® technology. 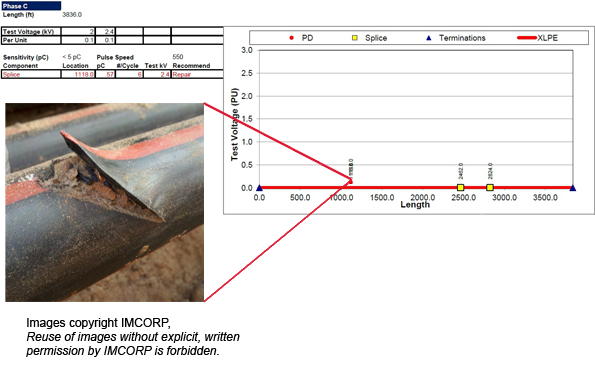 During the course of assessment, the IMCORP Field Supervisor came across an extremely rare case: a newly installed cable with electrical performance so poor it was deemed incapable of holding operating voltage. Significant partial discharge activity was detected at a fraction of the operating voltage, causing the test to be halted early. IMCORP was still able to locate the fault, and armed with that information the crew began to wheel off the distance from the Near End of the cable. The intent was to dig a pilot hole and perform a Location Match (another service provided by IMCORP that provides absolute certainty of defect location), but the pilot hole ended up uncovering a footage marker very close to the estimated distance of 1118 feet from the Near End. Digging a larger trench, the defect shown above was uncovered at 1105 feet from the Near End. On a 3832 foot long cable, that amounts to a location accuracy of 0.3%. The gash in the cable was deep enough that neutral wires were severed and earth had displaced the insulation, causing severe Partial Discharge well below operating voltage. Being able to locate this issue without destroying the defect site allowed for a comparatively quick and inexpensive repair. The day after the repair, the cable was able to undergo the complete Factory Grade® assessment.